After multiple leaked images and lots of hearsay – the facts are out. The Pioneer DJ DJS-1000 standalone performance sampler and sequencer has been officially revealed and will be available for purchase later this month. Pioneer DJ’s DJS-1000 boasts an intuitive, DJ-friendly interface and was designed to fit perfectly alongside the CDJ-2000NXS2 and DJM-900NXS2, giving DJs effortless unity in the booth. 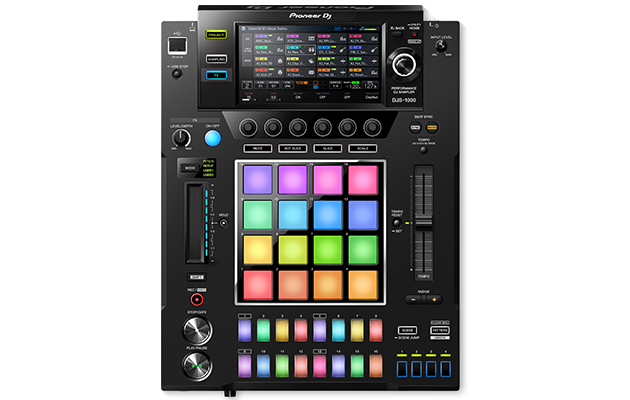 It includes a 7-inch full-color touch screen, 16 multicolored step input keys, multicolored Performance Pads, a host of inputs and outputs, Live Sampling and various other performance features. Created with performance in mind, the DJS-1000 was made to help professional DJs propel their sets to the next level. You can intuitively create unique sounds and phrases in advance of your set, or on the fly, then sequence and loop. The 7-inch full-color touch screen gives you all the information you need to perform, thanks to easily recognizable sequence patterns and instrument icons assigned to the Performance Pads. Retailing at for $1199, we think this sampler is going to be a hit. It’s already been seen in DJ booths including Walker and Royce at Dirty Bird Campout and reportedly visible on Luciano’s Instagram account. Find out more about the DJS-1000 on Pioneer DJ’s website and let us know what you think of the new sampler. Is this a piece of gear you’d like to use to enhance your performances? We want to hear from you – leave your comments below!